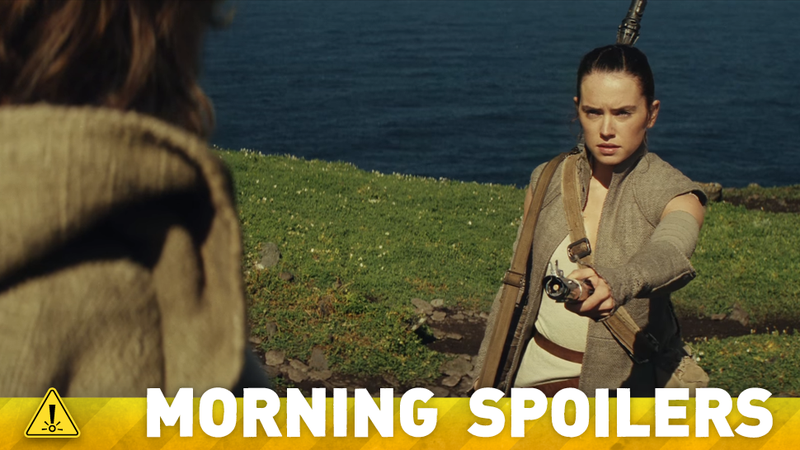 And yes, there are already rumors about Episode VIII’s subtitle. Has Doctor Who found its new companion? Nicholas Meyer discusses what will make the new Star Trek TV show different. The Walking Dead teases unhappy times for Rick, and hypes up Negan. Plus, new pictures from Agent Carter’s finale and Civil War. Spoilers Now! Me and Mark have been rehearsing a lot, and it’s really amazing. When we went back to Skellig to do the opening of [Episode] VIII, it was so crazy doing the same scene [as the end of Episode VII] with a different crew of people. He’s amazing to rehearse with, and I’m very excited to be doing the rest of the stuff. It’s such a good story. Seriously. Luke is so cool in this one. Really. Henry Cavill discusses looking forward to the Justice League team-up film, and Superman’s biggest exploitable weakness. We’re talking about ‘Justice League’ here, so this is the DC Cinematic Universe is finally getting its chance to really grow in this one, and I think all the characters are fantastic. I’m looking forward to being a part of that whole gig. We’ve got to consider Superman’s approach to everything. He loves humanity. He loves human beings. He doesn’t want to hurt them, and so Batman has an immediate advantage with that. Carla Gugino has confirmed she has a minor voiceover role in the movie. Here’s a strangely intense new TV spot for the film. Marvel.com has released a gallery of images from the film that were recently featured in Empire’s Civil War cover story. Find more at the link. Sources speaking to the Radio Times claim that British actress Rakhee Thakrar is on a shortlist for actresses auditioning to become the next companion on the show. Thakrar is best known to UK audiences for her role as Shabnam Masood in the soap Eastenders, which she left last month. Andrew Lincoln says there’s not much happiness in store for Rick in the rest of season six. Negan is one of the greatest villains ever created in TV. It’s the greatest comic book villain I’ve ever read. He’s amazing, he’s terrifying, he’s funny, he’s charming, and the reason why I think he’s so terrifying is he makes a certain amount of sense. Even though he does horrible, horrible horrific things, there’s a certain logic—a barbaric logic, but a logic—to it. I think it’s not just the horrible things he does, it’s the appeal of that logic. It takes a little while to wrap your head around it. It’s betrayal and disappointment in himself. Because it’s almost like he’s been through this before, and he can’t believe he let himself go through it again. As we saw in the midseason finale episode, Ward is back on Earth, but he’s definitely not the same Ward who went through the portal to the alien world… Our version of Hive is going to have its own unique twist and be very different from what fans have seen so far. We will see similarities that pay homage to the original character, but fans will see that Hive is taking an exciting new direction in the world of Marvel’s Agents of S.H.IE.L.D. Grant Ward has been one of the most compelling characters and captivating villains to write for and Brett Dalton has taken on every challenge with ease and a presence that is unmatched. Ward has evolved in every season of ‘SHIELD’ and we are so excited for fans to see our take (and Brett’s take!) on this well-known character. Additional reporting by Gordon Jackson and Charlie Jane Anders. Image: Star Wars Episode VIII.